Nuclear Business Directory, Moscow, 1995, p. 77. 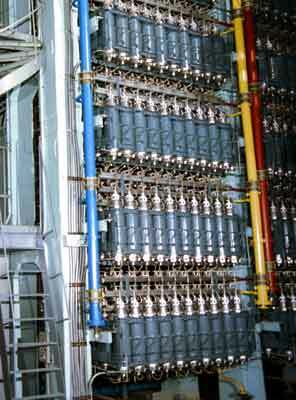 Founded in 1954, the AEKhK produces and enriches UF6 for nuclear fuel. On 21 October 1957, 308 gas diffusion machines were put into operation and started the process of continuous uranium enrichment. The first lot of enriched uranium was produced on 28 October 1957. In 1963, construction was completed and the combine started operation in full. The UF6 conversion plant, which was built parallel to the gas diffusion plant, produced its first lot on 29 October 1960 and started functioning at full capacity by the end of 1962. Leading research institutions, such as the All-Russian Scientific Research Institute of Chemical Technology (VNIIKhT), the All-Russian Institute of Energy Technology (VNIPIET), the Mendeleyev Moscow Chemical-Technological Institute (now Mendeleyev Russian Chemical-Technological University), the Research Institute of Chemical Machine Building, "Sibakademproyekt," the Central Design Bureau for Machine Building (CDBMB) and the Experimental Machine Building Design Bureau (OKBM), were involved in the development and creation of the new equipment. The prime objective was to "expand the arsenal" of the Soviet military. During a period of reconstruction from 1962-1985, new equipment was installed, which increased the productivity of the gas diffusion plant two to three times, and increased the productivity of the chemical plant by almost five times. In the 1980s, the production of highly-enriched uranium was stopped and AEKhK switched to uranium enrichment for the nuclear power industry (enriched up to 5% U-235). Several sources indicate that the Angarsk Combine, being a uranium enrichment facility, has never been involved in the production of weapons-grade uranium. [5,6] In 1990, the combine began operating its first two gas centrifuges, and in 1992 the last gas diffusion machine was stopped. NEI's World Nuclear Industry Handbook 1995 lists AEKhK's annual conversion capacity as 18,700 MT of uranium. 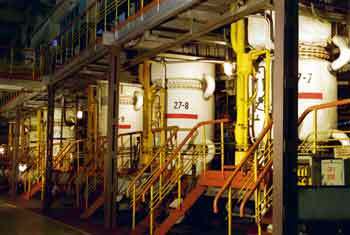 AEKhK produces LEU using centrifuge technology, with an annual capacity of two million SWU. Trade relations with foreign partners (established in the 1980s thanks to close cooperation with the Department of nuclear-chemical production and Tekhsnabeksport) expanded to new markets in the 1990s. Exports have been important in promoting growth and stability at AEKhK. Overall, 50% of the Combine's output is produced for export. AEKhK exports enriched uranium to the United States, United Kingdom, Germany, Finland, France,China, the Republic of Korea, and other countries. The combine's employees are participating in the construction of a gas centrifuge plant in China. A special design and technology department is in charge of developing new technologies. AEKhK is also involved in civilian production. It manufactures individual dosimeter systems; professional gamma radiation dosimeters; extra pure lithium, barium, calcium and lanthanum fluorides; and optical and scintillating fluoride monocrystals. AEKkK employs approximately 6,500 people. Angarsk Electrolytic Chemical Combine Web Site: http://www.aecc.ru. Pavel Podvig, ed., Strategicheskoye yadernoye vooruzheniye Rossii (Moscow, IzdAT, 1998), pp. 73. SOURCE: Department of Commerce, Gov. of the U.S.
in nuclear power plants, and a variety of chemicals. hydrogen), milk pasteurizers, and butter churns.